In the lead up to Spring Festival, Premier Li Keqiang has paid a visit to quake-hit areas and poverty-stricken villages in Zhaotong in Southwest China’s Yunnan province. In Yuancheng Street, booths were selling items to celebrate the coming festival, including local food and beverages such as Chinese sausages and cane sugar. Premier Li bought several boxes of cane sugar after a short walk around the more than 20 stalls in an unexpected visit to the street on the morning of Jan 23. In the afternoon, the Premier went to the relocation site for Ganjiazhai village which was smashed by a 6.5-magnitude earthquake three years ago. Premier Li toured one of the new houses, where survivor Gan Yongrong and his family have moved to live since Dec, 2015. Gan’s wife was killed in the disaster, leaving three boys to be cared for by his elderly mother. After a short talk, Premier Li gave the family special gifts, including the cane sugar he bought that morning. “I purchased the cane sugar with my own money, and I hope your life can be as sweet as the sugar,” the Premier said. Premier Li also gave New Year’s money to Gan’s sons in three red envelopes. The sum was unknown but symbolized good wishes with a supposedly auspicious number according to the Chinese tradition. It has become tradition for the country’s leaders to visit people in less-developed areas before the most important festival each year. 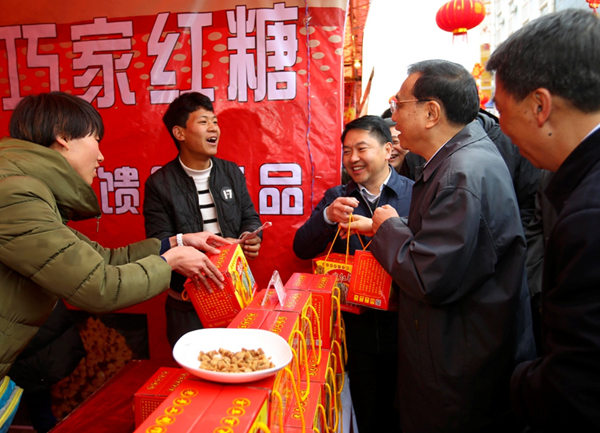 As well as the cane sugar, Premier Li’s special purchases for this year’s Spring Festival included a bamboo basket that carried peanuts, dried sunflower seeds, roasted pistachio nuts, red dates and chocolates covered by a special Chinese character that means to exert a pull on good luck and fortune. In Chinese culture, each of these items represents good wishes for an enjoyable life. The Premier then traveled one and a half hours drive on bumpy dirt roads to Yujiadachong village in the city’s Zhaoyang district. At Yang Changlan’s home, Premier Li enquired about her income and daily life before presenting her his gifts: the bamboo basket, cane sugar and a red envelope. Yang took the gifts and extended her gratitude by repeating thanking the Premier. Since taking office in 2013, Premier Li has visited far-flung or poverty-stricken villages each year before the Spring Festival. In addition to offering greetings and good wishes, the Premier also enquired about price fluctuations in the market and residential incomes, which have a big impact on people’s livelihood. His purchases differ each year, depending on who he meets. Last year, the Premier bought new coats for an elderly couple in a nursing home in Guyuan, Ningxia Hui autonomous region. He also bought Chinese knotting representing good fortune and longevity for the nursing home, and hung the knotting on the wall himself.